This post about finding the right sneakers to alleviate foot pain has not been sponsored in any way. I just wanted to share my recent shopping experience with my readers. In the last few years I have suffered from an assortment of aches and pains, none of which the doctors can find any actual cause for. My most recent trip to the doctor was a visit with the Podiatrist for foot pain that would not go away. After Xrays and assorted stretching exercises, the podiatrist could still not give me a reason for my foot pain. Just add it to the list of stuff on my body that doesn’t work right. He gave me some stretches to do but other than that had no suggestions other than to come back and we can run more tests that will probably STILL not diagnose the cause of my foot pain. Ok, he really didn’t put it that way but that is how I feel. I decided to see if investing in a new pair of sneakers might help with my problems. My husband is a marathon runner so he knows all about the importance of finding the right sneakers. 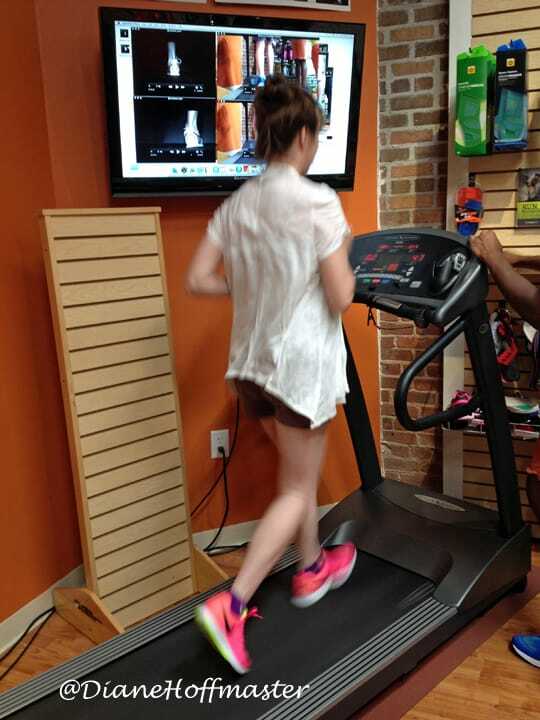 With my son starting cross country this summer we decided he needed a new pair of sneakers, too, so we headed into Big Peach Running Company in Decatur to get our feet and gait analyzed. They have some pretty sophisticated machinery that helps look at the way your feet are shaped and how you move. Taking these factors into consideration when buying new sneakers can play a big role in foot health. 1. Understand your arch! Having a shoe with a HIGH arch if your arches are rather shallow will just cause you even more foot pain. Apparently, my feet have two different arch profiles with a normal arch on the right and almost no arch on the left. 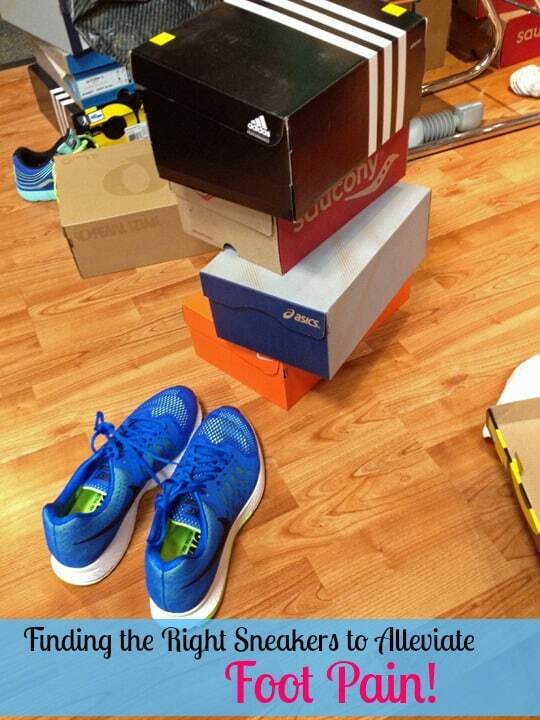 A challenge when buying new sneakers to alleviate foot pain, that is for sure! Oddly enough, my son has the EXACT same arch pattern…I wonder if that is genetic or a total fluke! 2. Understand your gait: When we walk, our feet and ankles roll a certain way to help reduce the impact of our bodies hitting the ground. Every person rolls into this impact a different way. This is called pronation. Certain sneakers offer a firmer support to reduce pronation than others. Choosing the right sneaker to help support your ankle and reduce the amount of pronation in your gate may be an important part of reducing foot pain. 3. Look at LOTS of shoes. Make sure you pick a store that has tons of shoes for you to try on. Don’t order on the internet, you will have no idea how the shoe actually fits and returning them can be difficult. Don’t be in a hurry to pick the first one that feels good either. Just try them on, take a few laps around the building and try another pair. 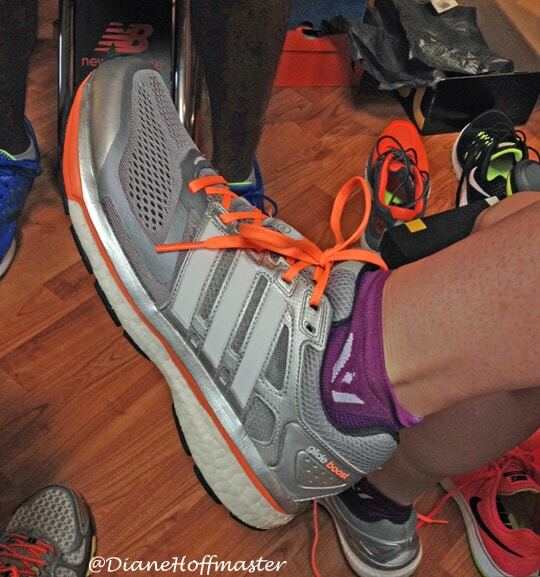 Get a shoe that is wide enough for your foot without being loose. You want a good thumb’s width between the top of your big toe and the tip of the sneaker to make sure your toes have room to move. 4. Don’t look at the price tag! This is really hard for me to do! I don’t usually spend a ton on my shoes. Looking for last year’s clearance shoes and using a coupon is usually more my style. But, I am sick of living with foot pain so I didn’t even ask about price until we found the shoe that seemed to fit me perfectly. Combined with the price of my son’s new shoes for cross country I could pretty much have paid for a week’s worth of groceries for the money we spent on sneakers this weekend. But, if they help alleviate foot pain and I can walk without hobbling around everywhere it will be worth every penny. It has only been a couple of days so I will have to reserve judgement as to whether the shoes I bought are going to work miracles. I can say that they are by far the most comfortable shoes I have ever walked in! Considering how much work and money went into buying these things, I really hope they help alleviate foot pain! Do you suffer from foot pain? 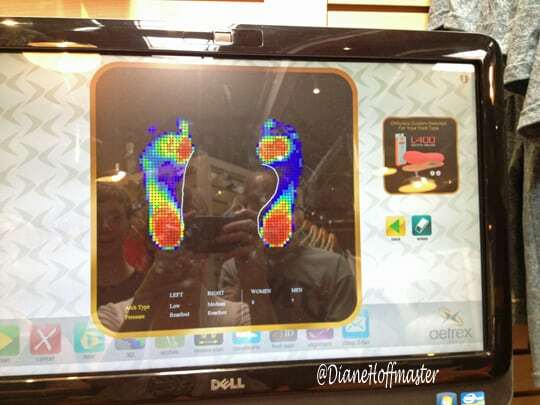 Have you ever had your arch and gait analyzed?